Brown bananas are used in items like smoothies and banana bread. If you want to make something that calls for ripened or brown bananas, ripen them quickly. If you have some time, place the bananas in a paper bag with a slice of apple to speed up the process. This may take a couple of days. 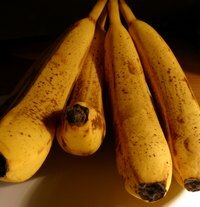 If you are even more in a hurry, use the heat of an oven to ripen the bananas in a few minutes. Preheat your oven to a low setting of about 300 to 330 degrees. Turn your oven light on or leave the oven door open so you can monitor the bananas closely. Place your bananas on a cookie sheet or sheet tray. For a more even ripening process, remove the bananas from the bunch and lay them separately on the sheet. Keep a close eye on your bananas. Watch for them to turn brown or black which signals that you need to pull them out of the oven. The time you leave the bananas in the oven will depend on how ripe they were to begin with. Let the bananas cool before handling them.